Convention goers attend this event to people watch individuals in superhero garb, to buy exclusive artwork, comics, collectibles/toys. As always anyone in attendance wearing costumes to this event are always happy to pose for pictures with other attendees (just ask politely). There is also convention floor space devoted to professional cosplayers (models in costume) who will pose for pictures with attendees for a small fee. There are also special guests who are familiar to everyone who watches film and television. These special celebrity guests are there to meet and greet their fans’ sign autographs, be there for photo opportunities with their fans (for a fee). A list of some of the big names in attendance include Arnold Schwarzenegger, Jeff Goldblum, Rick Moranis, William Shatner, John Cusack, Jonathan Frakes, to name a few. My favorite thing to do at these conventions is to go to these Q&A panels some of these celebrities have during the convention. Most of these panels are open to every convention attendee, but there were a few that were VIP exclusive panels. I attended seven panels total two of which were exclusive. The panels I attended were of the celebrities that I had a connection with from my youth. These people entertained me, made me laugh, and in a small way helped me develop into the person I am today. These special guest panels included William Shatner (Star Trek, Capt. Kirk), Rick Moranis (SCTV alum, Spaceballs, Dark Helmet), Jim Lee (comic book Artist), Arnold Schwarzenegger (The Terminator), Neve Campbell & Rachel True (The Craft), John Cusack (Hot Tub Time Machine), Jonathan Frakes (Star Trek Next Generation, Cmdr. Riker). All of these panels were interesting and some were very entertaining. I don’t hide the secret that I’m a Trekkie, but I have to say that the two most entertaining panels I attended this past weekend were William Shatner & Jonathan Frakes both fan favorites of the Star Trek franchise. I’ve seen William Shatner before at another convention, and to say that when he’s in the room that he takes center stage is an understatement. Mr. Shatner is like a force of nature, he had no moderator for his panel he just walked in a pulled his seat to the center front of the stage and started talking to the audience. He had the audience eating out of his hands talking about funny anecdotes about his life and career. I think that most people got the Shatner experience they wanted. The last panel I attended at the convention was for Jonathan Frakes, who played Cmdr. Riker in Star Trek the Next Generation films and television series. I didn’t know what to expect from Mr. Frakes, but in my opinion his was the best panel of that weekend. I waited in a room set aside for his panel for about ten minutes and then lined up to enter the panel room to be seated and waited for another ten minutes. Everyone in the room was talking amongst themselves then out nowhere someone yells out loud “RED ALERT!! !”, it was Mr. Frakes. The crowd began to roar with applause, and the panel began. Mr. Frakes was very funny, self deprecating, and down to earth, he was totally engaged with the audience, and their questions. Everyone there knew that he wanted to be there. To me that’s what you want from these special guest celebrities, I’ve seen some celebs in past conventions that acted like they would rather be elsewhere. 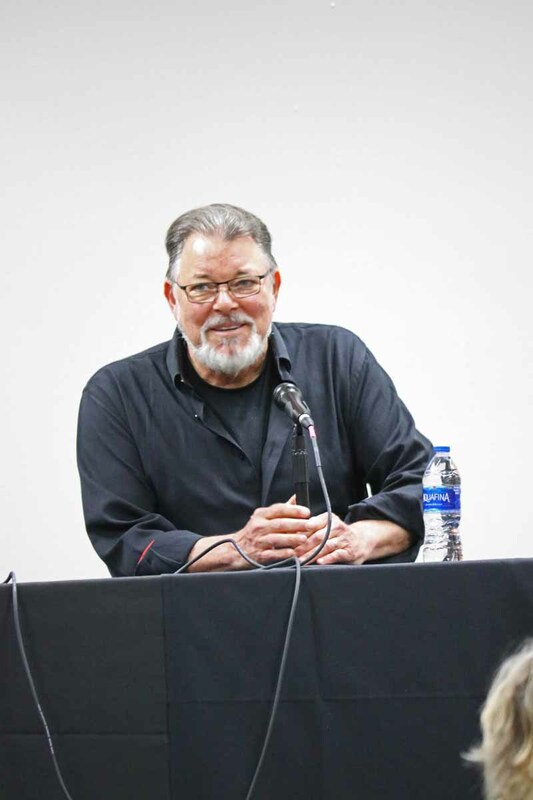 If anyone has an opportunity to see Mr. Frakes at a convention, do it you won’t be disappointed. I went to see the Craft panel that had two of the four lead actresses from the movie, Neve Campbell, and Rachel True. Both of these ladies were very charming and engaged with the audience. Some of the audience questions were very interesting regarding whether these actresses would ever reprise their past TV or film rolls. Ms. Campbell said she would not do another Scream movie, she wouldn’t be interested, because of the passing of Wes Craven the director/ producer of the Scream franchise. Another audience member asked Ms. Campbell, about a potential reboot of the Party of Five TV series. She said that the producers are rebooting the series but with a slightly different premise, the new television family will be Hispanic, but instead of the mother and father being killed off with their children having to raise themselves, the parents are deported from the country. That was a thought provoking topical premise for this reboot. I didn’t know about the potential new TV show, but that’s one the things you get from attending these panels, sometimes you get some inside info on what to look forward to in the entertainment world. Another panel that I attended was for the actor John Cusack. Anyone who grew up in the 80’s that saw John Hughes movies or any teenage angst films from that decade is familiar with Mr. Cusack’s work. He was very funny and very relatable with the panel audience. He was asked questions about the business, and gave very sound advice, he stated if you want to direct you need to become an actor first in order to understand an actor’s point of view. People kept on asking him about famous quotes from his films. One question was about the film he made called High Fidelity, which was the actor Jack Black’s breakout roll. The question was did Mr. Cusack know how good Jack Black was, he told the audience he knew how good Black was, and that he really had to talk Black into doing the movie. I also attended a panel from an individual known the world over from the comic book industry Jim Lee. I started my appreciation for Mr. Lee’s artwork in the early 90’s because of his work on the X-men comic book series. From my personal knowledge, this gentleman is an innovator in the industry; he was one of the co-founders of Image comics. Jim was very down to earth answering questions from the panel audience, while doing so he graciously drew some sketches to give to some lucky audience members. The previous panels I’ve written about were open to the general convention attendees. The next two panels I’ll discuss were VIP exclusive panels; you needed to have a VIP pass in order to enter. These panels were for Rick Moranis, and Arnold Schwarzenegger. People had to shell out considerable coin for these VIP passes for both of these two gentlemen, which included autographs, photo ops, exclusive panel, and a three day pass to the convention. I’ve always been a fan of SCTV (Second City TV) so when I heard a cast member of that TV show, Rick Moranis was going to attend this event; I had to go see him. There is a reason that there hasn’t been much news about this gentleman, because he had taken an almost 20 year hiatus from the entertainment industry in order to raise his young children. So Mr. Moranis attending this event was a big deal. This comedic actor has been in some blockbuster hit films, Ghostbusters, Honey I Shrunk The Kid’s, Spaceballs, Parenthood, to name a few. Mr. Moranis was very laid back and happy to answer any question posed to him from the panel audience. He was asked how was it like to work with Mel Brooks. He related to the audience that Mr. Brooks was very democratic when it came to ideas for the film as long as they were good he didn’t care where they came from. Another question was asked of him regarding the current state of comedy, he stated most comedy today is geared towards a cheap easy laugh using foul language and vulgarity. He said back when he was working on SCTV, the material was written to work for a laugh. At the end of the panel Mr. Moranis was taken by surprise when he was given a special plaque for attending the event by a mix of Star Wars imperials, and some Spaceballs in costume. It was a great panel experience. The other VIP exclusive panel that I attended was for the major headliner of this comic con event, Arnold Schwarzenegger. I have to say that having this special guest was a considerable get, Mr. Schwarzenegger hasn’t done an event like this in almost 30 years. The last time this gentleman did an event like this was around the Terminator 2, film release. What can I say Mr. Schwarzenegger has been in some huge blockbuster hits; The Terminator, Conan The Barbarian, Predator, Kindergarten Cop, to name a few of his great films. His panel experience was very brief due to time constraints, but he did talk about his career in film. He gave some interesting anecdotes, one of which was that he originally tried out for the part of Reece , in The Terminator film. The director of the film James Cameron had to talk Mr. Schwarzenegger into taking the part of the Terminator; Schwarzenegger thought because of the lack of dialog lines that it would setback his acting career. He eventually took the part and the rest as they say is history. It was a good panel but very brief it only lasted about 20 minutes. My overall impression of this event was very favorable; I think all the attendees had a good time. I do have to say that I much prefer having this event at the Henry B. Gonzales Convention Center. I believe that the Henry B., is better suited for this kind of event because of the amenities, the huge floor space, and panel room facilities. I will say that last year the Alamo City had a special Halloween edition con at the dome, and the space this year at this facility was better utilized. At last year’s event there were no panel rooms, very few concession stands, and only the field area of the dome was used for convention floor space. This year most of the concession stands were open, there were three panel rooms made available to the convention going public, and multiple levels of the dome were open to attendees. I know in the past at this event that local artist’s have been priced out of exhibiting and selling their artwork at the convention. I know that the convention organizers have seen that problem and have worked toward addressing this situation. This year there was a great idea of utilizing the multiple levels at the dome. Artists were given the opportunity to display and sell their art on the fifth floor level hall, at an affordable fee. The only problem with this was no foot traffic thru this area by convention goers. Most convention attendees didn’t even know that there were other floors at the dome people could roam around in. I went all three days to this event, and I didn’t even know on the first day that there was any activity going on fifth floor where the local artists setup their booths. I think that the artists would have been better suited displaying their work on the first floor were people first enter the dome. If the people entering this event had seen tables full of artwork or merchandise, the foot traffic would flow towards these artist/vendors. I spoke to several artists about this situation and they said that the lack of foot traffic really hurt their bottom line. That being said most of the artist’s said that they would still do this convention again. Another issue I saw was the lack of general knowledge of where things were being held at the event, by the dome employees. In times past there was an army of volunteers working for the convention directing traffic, giving people convention info. I think the previous issue I described about the lack of foot traffic thru the artists fifth floor would have been alleviated by some convention volunteers standing in front of the dome’s elevators directing people to the fifth floor. This convention is growing in scope and has become a major comic con destination not only for this state but for this country. Every year of this convention has had its successes and its challenges. The organizers of this event have seen what works and doesn’t work, next year they will improve upon these issues, to bring about a better convention experience for everyone.